Lemons and garbage disposals get along quite well together. Lemons -- both the rind and the juicy fruit portion -- are good for cleaning disposals. Not only will the citrus in the lemon help remove particles that can clog and muck up a disposal, but it will leave your sink and disposal smelling lemony fresh. One good reason to use lemons as opposed to chemical-based cleaners is lemons are completely natural and harmless to both the environment and your household plumbing. Lemons that are squeezed out for your juice and cooking projects are ideal for the disposal as well. Slices of lemon are perfect for freshening garbage disposals. 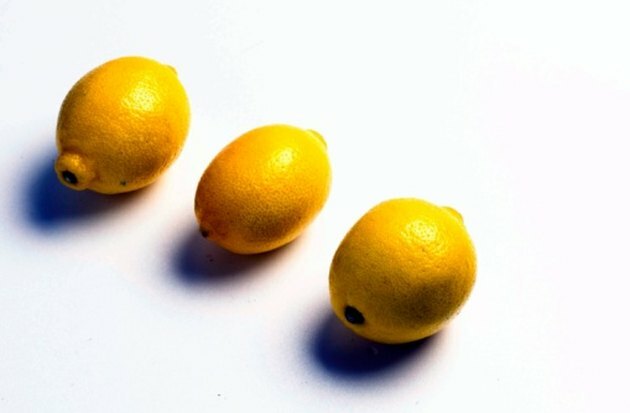 Slice up a lemon or two into a few pieces. A lemon that is starting to go bad or is partially unused will work as well -- it needn't be an ideal lemon you would serve as food. Squirt a few drops of the lemon juice into the disposal opening and let it sit for a few minutes to help loosen anything that's caked onto the disposal blades. Run some water in the sink, letting it flow into the disposal opening. Turn on the disposal and drop in the lemon chunks one by one until they're pulverized. The citrus juice combined with the rind texture will clean the blades and freshen the disposal. Many garbage disposals have rubber flaps at the opening to help keep things from splashing up into the sink during use. These flaps can get quite dirty, as they are in a hard-to-reach, hard-to-clean area of the sink. The metal opening of the sink which meets the rubber flaps can also get quite grungy. Next time you make fresh lemonade or use lemons for a culinary project, mash the lemon rind (yellow-side up) around the opening of the sink and rubber flap area as if you were using a sponge. The rind and any pulp left on it will help degrime the opening of the disposal. To get rid of the dirty rind, simply chop it up in the disposal, which, as you know now, will help clean and freshen it as well. Toss a handful of ice cubes into the disposal. This is a wonderful project if you have an ice maker in your fridge and haven't used any of the cubes in a while -- you can clear out the old, not-so-fresh cubes and put them to good use. Add a lemon or part of a lemon. Old, past-their-prime lemons are fine for this project. Run the sink's cold water over the disposal opening, turn on the disposal and let it grind. Lemon juice will also work in place of the lemon -- this is ideal if you have old lemon juice in the fridge. If your disposal odors are ominous and you suspect there is buildup on the blades, pour a couple tablespoons of salt down the disposal, add five or six ice cubes and half a lemon (or whatever lemon portions you have around the house -- lemon juice will work once again as well). Run the sink's cold water, then turn on the disposal. As an added bonus if your sink needs a little cleaning, first sprinkle some salt in a damp sink, rub a cut lemon over it to scrub a bit, then throw the salt/lemon combination down the disposal with some ice cubes.